The phrase “third rail” refers to the untouchable rail on mass transit systems, suggesting negative stories about Jews and Israel are too hot to handle. Burleigh did not respond to an inquiry from JTA asking her to elaborate on the tweet. Kendzior asserted that “the press seems particularly reluctant to pursue these [stories]. Which is not surprising since those who do write about them are threatened.” By whom, she did not say. Posted on 26 January 2019. Tags: U.S. out of the Middle East! 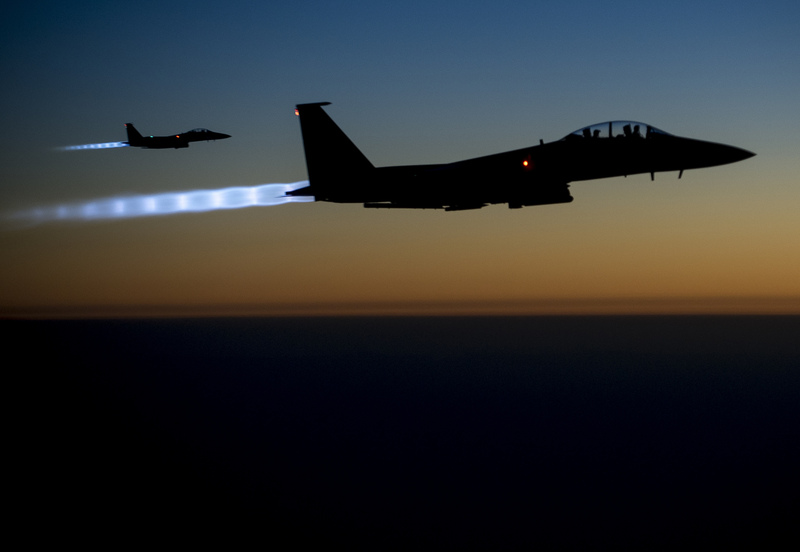 A U.S. aircraft returns from an illegal bombing mission over Syria in 2014. (DoD photo by Senior Airman Matthew Bruch, U.S. Air Force/Released). The slogan “U.S. Out of the Middle East” should not be controversial for any leftist or class-conscious worker. The decision to remove 2,000 U.S. troops from Syria must be extended to include the over 5,000 estimated “contractors” — i.e. mercenaries — in Syria. U.S. bombing anywhere in Syria is a violation of the country’s sovereignty and of international law. The retreat and departure of U.S. forces confirms Western imperialism’s defeat in Syria, after seven years of catastrophic war. That is why the U.S. ruling class — from liberal to conservative — is up in arms about Trump’s decision, and why the corporate media howls as if the sky is falling. It also creates a new grave political crisis for the Trump administration. Although Trump is technically the “commander-in-chief,” the president functions primarily as a manager for the collective interests of the bourgeoisie. Those collective interests are primarily safeguarded through the permanent bureaucracy of the institutions of the state, and for U.S. imperialism chief among those institutions is the military high command. The resignation of Gen. James “Mad Dog” Mattis signals that this sector of the ruling class has begun to rebel against him as well and that Trump’s destabilization of the Empire is intolerable for them; whether he can survive this struggle within the ruling class amid a plummeting stock market, a likely government shutdown and multiple corruption investigations, is an open question. Regarding the situation of the Kurds in northeastern Syria, the PYD/YPG are not political novices. They knew this day was coming — even if the precise day was a surprise. The U.S. complicity in the Turkish invasion of Afrin earlier this year, the contradictory statements of leading White House officials, against the backdrop of a century of imperialist back-stabbing of Kurdish forces, have made it clear that no Western power can be counted on to protect the Kurdish people. A considerable faction within the Kurdish forces in Syria have long been calling for a reorientation towards an alliance with the Syrian government — as has happened on multiple occasions during the war, such as in the battle for Aleppo. An agreement of this sort, which would be based on preserving the territorial integrity of the Syrian state, was not made in time to prevent the catastrophe in Afrin, leading to the loss of the city and 100,000 displaced Kurdish residents, but this time there will be considerable momentum to do so. The PSL opposes any Turkish invasion of Syria and its genocidal war on the Kurdish people inside and outside of Turkey. We support the Syrian and Kurdish forces in the defense of their homeland against Erdogan’s dream of creating a neo-Ottoman empire. We oppose any calls, however, for U.S. troops to remain in Syria as if Trump has not already quietly agreed to Erdogan’s war, and as if one section of NATO will somehow be a benign force against another. The only road to national liberation and self-determination is based on the alliance of Arab, Kurdish and all peoples of the region against the NATO powers that have divided and invaded it for over a century. Posted in Middle East, USAComments Off on Statement: For a full withdrawal — U.S. out of the Middle East! These are transitional times, as humanity moves out of one civilisation imbued with certain ideals, values and beliefs to a new way of living based on altogether different principles. They are times of unease and insecurity certainly, but also times of great hope and opportunity. If humanity is to progress and the natural environment is to survive, fundamental change in the way life is lived is essential – systemic change as well as an accelerated shift in attitudes and values. Many people throughout the world recognise this and are advocating such a shift, but those in power – political and corporate – reject such demands and do all they can to maintain the status quo and perpetuate the existing unjust systems. Despite this entrenched resistance, the new cannot be held at bay for much longer: change is coming, the question is when, how and with what impact it will occur, not if. Widespread uncertainty is in part the result of this sustained intransigence, coupled with the instability within the socio-economic systems, which are in a state of terminal decay. Fuelled by the past, they are carcasses – forms without life. The pervading uncertainty is being exploited by the reactionary forces of the world – powerful forces using fear to manipulate people and drum-up what we might call tribal nationalism, as opposed to civic nationalism, in order to assert themselves, and in many countries they appear to be in the ascendency. The current explosion of tribal nationalism, or right-wing populism, is a crude response to worries about immigration and national identity, coupled with genuine social injustices including economic hardship and unemployment. Throughout the world right-wing groups with protectionist economic policies and anti-immigration views continue to gain support and in some cases win power. The loudest sign of this regressive trend was the election of Donald Trump as US president in 2016. His nationalistic, “America First” message fuels intolerance and division and encourages national self-interest. It casts a shadow of suspicion over foreigners, particularly those that think, live and pray differently, and it is by nature inward looking and brittle. Strengthened by Trump’s election, far right and ultra conservative politicians in other countries have flourished. Throughout Europe right-wing and far right parties have been empowered: Prime-Minister Viktor Orbán of Hungary (who has repeatedly called for an end to “liberal democracies” in Europe); President Recep Erdoğan in Turkey who has attacked the media, centralised power and is pursuing a form of Islamic nationalism; the Law and Justice government in Poland; Matteo Salvini, Italy’s deputy prime minister; the Freedom Party in Austria; Jair Bolsonaro the newly elected president of Brazil and Prime Minister Narendra Modi of India. In Russia, according to a series of studies conducted by the Research Council of Norway, “nationalism has been growing since the dissolution of the Soviet Union (1990-91), along with attempts by the regime to commandeer it. These political parties, and others, have adopted what the Economist describes as “a pessimistic view that foreign affairs are often a zero-sum game in which global interests compete with national ones. It is a big change that makes for a more dangerous world.” The Brexit vote (52 per cent voted leave, 48 per cent remain in the 2016 referendum) in the UK was another example of how right-wing politicians manipulated a disgruntled populous by inflaming nationalistic sentiment and intolerance. The vote to leave was in many ways a protest vote – a negative vote – largely against freedom of movement of people from Europe, i.e. against immigration. Duplicitous advocates of leaving the European Union, mainly from the Conservative and UKIP (United Kingdom Independence Party) parties, used slogans like “taking back control” and taking “our country back” to win support for their campaign. Consistent with the response in other countries, many who were won over by the nationalists agenda and voted to leave where over 60 years of age. Young people (those under 30) who will feel the impact of leaving most, commonly see themselves as “citizens of the world” and overwhelmingly voted to remain part of the European Union. Images of the self which are rooted in any form of ideology (religious, political, racial, etc. ), imprison and divide, feeding intolerance and division. All of this is in opposition to the movement and tone of the time, which is towards greater levels of cooperation, tolerance and understanding of others. Within the paradigm of tribal nationalism “the other” – other nations as well as people from other nations – are seen as threats, as rivals, and are viewed with suspicion, if not outright hostility. When outsiders are described in inflammatory terms, such as “murderers”, “rapists” and people who “infest” the pristine nation, fear and anger are facilitated, violence legitimised and a process of dehumanisation of “the other” set in motion. As history shows when this takes place unbridled atrocities are perpetuated. Civic nationalism, on the other hand, brings the people of a particular nation together around common values to work for the good of the community. It encourages cooperation, tolerance and sharing and can serve as a stepping stone to global responsibility, in the form of collective action in which the skills, gifts and abilities of the individual nations of the world are used for the benefit and enrichment of all, and not just for the nation state. Conversely, tribal nationalism is tied to the old ways of competition and suspicion, it is a dangerous ideology which is being cynically employed by right-wing politicians who see widespread public discontent as an opportunity to manipulate the argument and gain power. It is of the past, is detrimental to human development and has no place in our world. Posted on 26 January 2019. Tags: Mobilize and Defend Venezuela! Posted in VenezuelaComments Off on Mobilize and Defend Venezuela! VA’s Lucas Koerner examines the current conjuncture from Caracas. Can the US get enough countries to follow its lead and recognize opposition leader and claimant to the Venezuelan presidency Juan Guaido to make a real difference in Venezuela’s government? Which countries are backing Guaido already? Rick Sanchez breaks it down. Then we’ll hear from journalist Lucas Koerner in Venezuela, who argues that Guaido is “getting his marching orders from Washington” and ought to be in ordinary neighborhoods learning the problems of everyday people. The Trump Administration’s decision to recognize opposition leader Juan Guaido as “Interim President” is a dangerous escalation and a threat to Venezuela’s sovereignty. Some countries have followed suit while many organizations around the world call for respect to the Caribbean nation’s self‐determination. Here we bring you some solidarity statements. 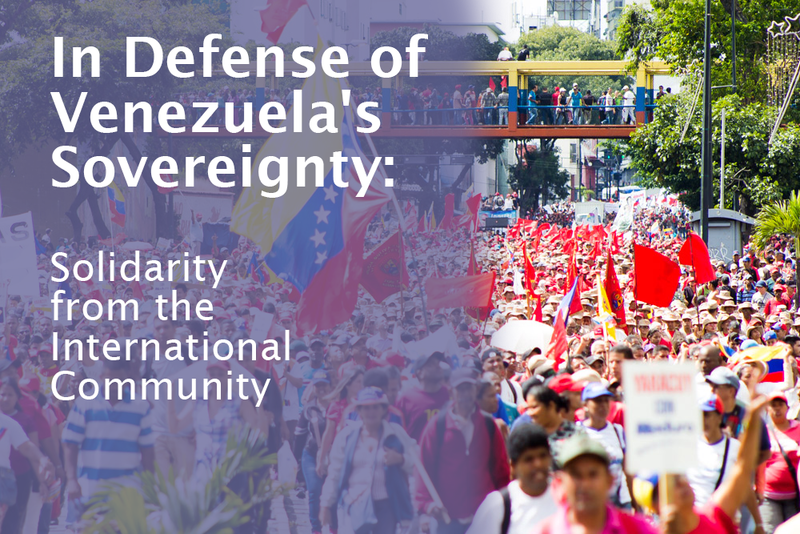 If your organization has a statement of solidarity with the Venezuelan people and the Bolivarian Revolution, you can send it to us at editor@venezuelanalysis.com. 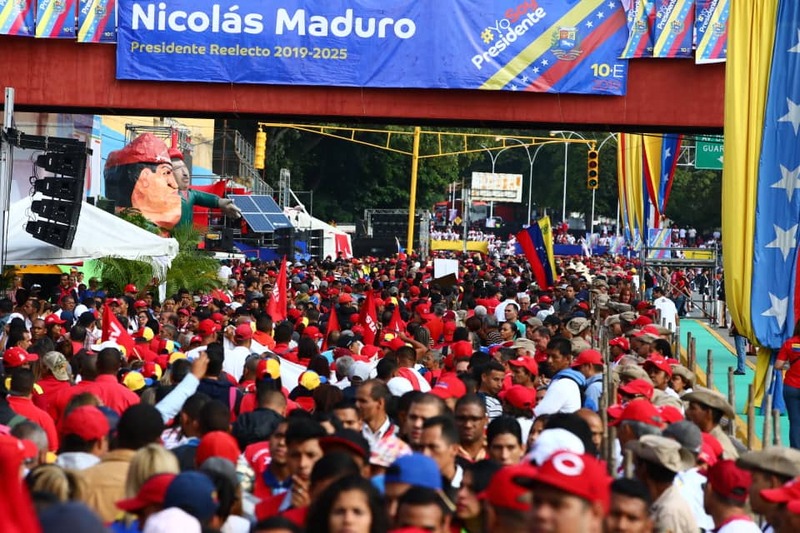 The views expressed in the following statements are the author’s own and do not necessarily reflect those of the Venezuelanalysis editorial staff. The US State Department and the Organization of American States declared that they would not “recognize” Maduro’s inauguration. Pays de Gex, France, January 11, 2018 (venezuelanalysis.com) – Venezuelan President Nicolas Maduro was sworn in on Thursday for his second six-year term in office. 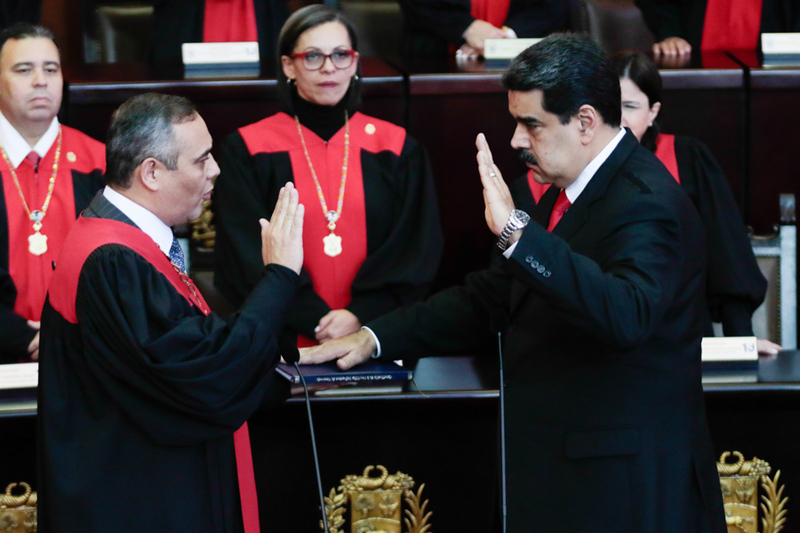 Following his electoral victory on May 20, 2018, Maduro was inaugurated in a ceremony held in the country’s Supreme Court. The inauguration usually takes place before the National Assembly. However, due to the opposition-held legislative body being declared in contempt of court in 2016 and therefore “null and void,” the ceremony took place instead in the Venezuelan Supreme Court, as dictated by the Constitution. The inauguration was attended by scores of international guests, including the heads of state from Bolivia, Cuba, El Salvador and Nicaragua, and high-level delegations from China, Russia and Turkey. In total, more than 90 countries were represented, between delegations that came especially for the occasion and diplomatic missions in Caracas. 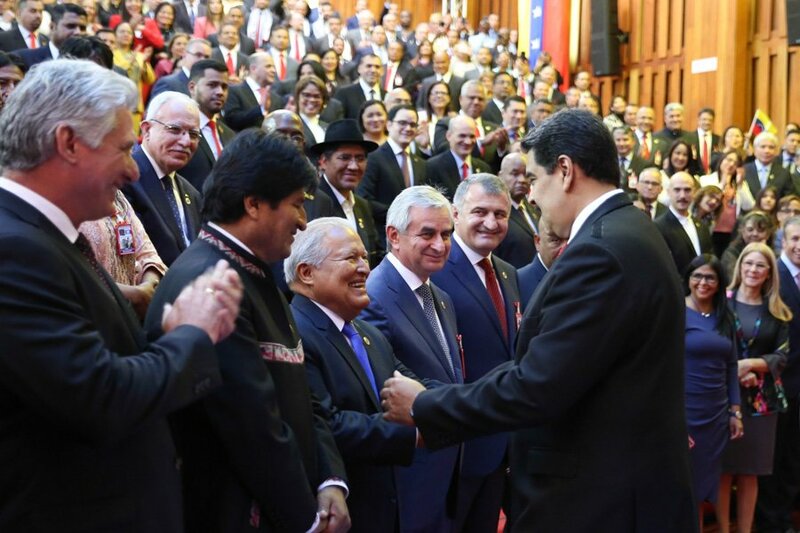 Likewise in attendance were Venezuelan governors, mayors, ministers, high-ranking officers of the armed forces and members of the Constituent Assembly, as well as representatives from popular movements and political parties from Latin America and elsewhere. International bodies such as the African Union, CARICOM (Caribbean Community), the Arab League, ALBA (Bolivarian Alliance for the Peoples of Our Americas), OPEC (Organization of Petroleum Exporting Countries) and the United Nations were also represented. The streets of Caracas and other Venezuelan cities also saw government supporters rally in support of Maduro. In recent days, popular movements had also been setting up “anti-imperialist camps” to defend Venezuela’s sovereignty. “I tell the people: this presidential sash is yours, this power is yours. It does not belong to the oligarchy or to imperialism. It belongs to the sovereign people of Venezuela!” Maduro declared in his speech upon taking office. He concluded by highlighting that the recovery of Venezuela’s economy and the fight against corruption and indolence are the government’s priorities for the near future, pledging to announce new economic measures on Monday before the Constituent Assembly. Thursday’s events also included a ceremony with the country’s armed forces, followed by bilateral meetings with some of the international invitees. National Security Advisor to the Trump administration John Bolton was one of the first to react, writing in a tweet that the US “will not recognize the Maduro dictatorship’s illegitimate inauguration,” and pledging to continue increasing pressure on Caracas. The Organization of American States (OAS), during an extraordinary session of its Permanent Council, approved a resolution not recognizing the legitimacy of Maduro’s second term, urging member states to take diplomatic, political, economic and financial measures to contribute to the “restoration of the democratic order” in Venezuela, and calling for new elections to be held. The resolution had 19 votes in favor, 6 against and 8 abstentions. William Castillo, Venezuelan vice-minister for foreign affairs, qualified the resolution as being “illegal” and not stipulated by OAS statutes. The OAS had previously tried to apply its democratic charter against Venezuela but failed to get the necessary 24 votes, while OAS Secretary General Luis Almagro has been one of the main advocates of “regime-change” in Venezuela, at one point even endorsing a military solution. For its part, Venezuela announced in April 2017 it would leave the OAS, as a response to the body’s “meddling” in its internal affairs. This process is due to conclude in April 2019. 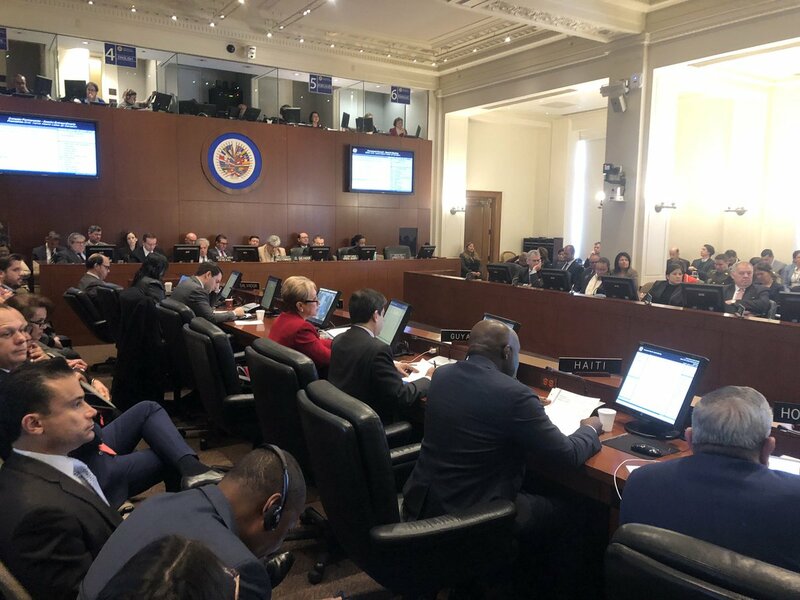 Following the OAS resolution, individual countries also issued their own statements echoing the same points, not recognizing Maduro’s presidency and reaffirming support for the National Assembly. Paraguay went one step further, with President Mario Abdo Benitez announcing during the day that the country was severing diplomatic ties with Venezuela. Peru also recalled its charge d’affaires from its embassy in Caracas. Peru and Venezuela have not exchanged ambassadors since July 2017. 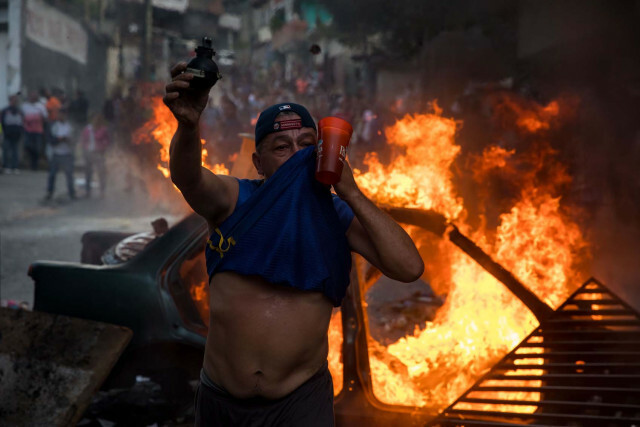 Maduro’s inauguration also saw reports of violent protests at the Venezuelan embassy in Lima, Peru, with Venezuelan Foreign Minister Jorge Arreaza calling on Peruvian authorities to ensure the safety of Venezuela’s diplomatic mission. The tone for these reactions had been set on January 4 by the Lima Group, formed by 13 Latin American mostly right-wing governments and Canada. In a statement, the group pledged not to recognize Maduro’s second term, calling on the Venezuelan president not to take office. The countries also vowed to “review” diplomatic relations and to impose sanctions on Caracas. For its part, Caracas lashed out at the statement, with Arreaza calling it a “humiliating subordination” to US interests. President Maduro also held a press conference on Wednesday in which he announced that Lima Group countries had been handed a diplomatic protest note giving them 48 hours to “rectify their positions” before Venezuela advanced with “urgent and crude” diplomatic measures. Maduro and Arreaza especially criticized the group for interfering in an “exclusively bilateral matter.” In its statement the Lima Group condemned an episode in late December in which the Venezuelan Navy intercepted a ship conducting oil explorations on behalf of ExxonMobil, authorized by Guyana near the disputed Essequibo region. Exxon-Mobil claimed that the ship was in Guyanese waters, but Venezuelan authorities have released pictures and audio recordings backing its version that the ship was in the projection of the Orinoco delta and thus indisputably in Venezuelan territorial waters. 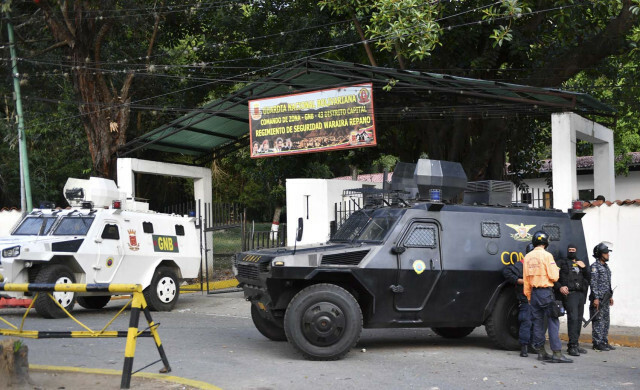 Merida, January 21, 2019 (venezuelanalysis.com) – A small group of soldiers have been arrested in the San Jose de Cotiza barracks in Caracas after they reportedly stole armaments and attempted to raise a mutiny in the Venezuelan capital.